April 2, 2012 July 17, 2018 - 14 Comments. If you grew up in the Midwest where German is the most reported ancestry, chances are you’re well acquainted with German food. My Kim grew up in Chicago where she was introduced to braunschweiger and weinerschnitzel years before she found out about tacos and tortillas. If you grew up in New Mexico, however, your first impressions of German food may have been formed (as mine were) from watching Hogan’s Heroes, the television situation comedy set in a German prisoner of war (POW) camp during World War II. During one particularly memorable 1969 episode, Colonel Klink, the prison’s commandant, hosted an Italian POW commandant who had studied under Klink. This meant a visit to a local hofbrauhaus in which copious portions of German beer and food were served. Although the gastronomic distress suffered by the Italian commandant was hilarious, it made me wary of such German dishes as weinerschnitzel, bratwurst and especially the dreaded sauerbraten. Worse, there was nowhere in New Mexico, where my wariness could be allayed. 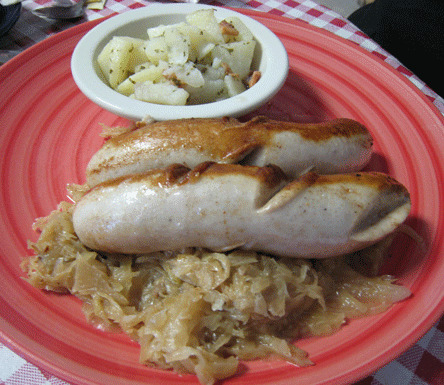 My first actual experience with German food took place in a Boston suburb in 1978. Contrary to the Italian commandant’s reaction (a combination of disgust, distress and disdain), I fell in liebe with the flavorful cuisine and the preponderance of pork, beef and poultry deliciousness and its stick-to-your-ribs qualities. It would be eighteen years before Dagmar Schulze Mondragon would launch her eponymous restaurant on South Broadway and seventeen years until I returned to the Land of Enchantment for good. What a wonderful convergence of fates! Save for well traveled New Mexicans and those who served in the armed forces, Dagmar’s is likely where many of my fellow New Mexicans first sampled the rich diversity of German cuisine. She has shared the cuisine of her maternal homeland throughout the Duke City in four different locations since her inauspicious launch in 1996. The current home of her full-service restaurant is in the Brentwood Hills shopping center in Albuquerque’s far Northeast Heights. On March 29, 2012, Dagmar launched a satellite operation in Rio Rancho, but it was open for fewer than six months, much to the consternation of Rio Rancho residents like me who love Dagmar and her food. Unlike some ethnic restaurants in Albuquerque, Dagmar’s doesn’t overwhelm diners with colorful nationalistic displays celebrating all that is great about that ethnicity. It’s got some steins here, a few banners there and several framed posters and sketches of German landmarks, but not enough to steer your focus away from your meal. You won’t need traditional German oompah-pah music resonating from ceiling speakers to let you know you’re feasting on terrific Teutonic treats. The cover of the menu does feature a photograph of Ludwig the Mad’s Neuschwanstein Castle, the inspiration for Disney’s Cinderella Castle and one of the most beautiful castles in all of Europe. Within the menu are pages of German favorites as well as several sandwiches and even a green chile cheeseburger that was once voted best in the city during a polling of a radio station’s listeners. Most entrees include a salad of mixed field greens. A dressing of Balsamic vinegar and canola oil at your table means is all the salad dressing you’ll need. Slices of traditional rye bread along with pads of butter are also brought to your table though you can also dip the rye in a mixture of Balsamic vinegar and canola oil. The rye, either dark or light, is outstanding and it’s homemade. To truly make the most of that rye bread, ask for a side order of braunschweiger, a type of liverwurst (pork liver sausage). This meat has a very soft texture and spreads very well on rye bread, even better if it’s dark rye. Though it does have a distinctive liver-based flavor, it’s not at all overwhelming. Dagmar’s version is even better than some we’ve had in Chicago where garlic is more liberally applied during the smoking process. Portions at Dagmar’s are profuse. It’s not uncommon to take home enough for your next meal. It’s also heartening that most of the entrees are accompanied by several side dishes, each of which might elsewhere constitute an entire meal. Some entrees are accompanied by saltzkartofteln (German-style baked potatoes) and perfectly seasoned, homemade sauerkraut. While many American hot dog stands serve a sauerkraut that will purse your lips, Dagmar’s version is much more refined and not nearly as tart. It’s among the very best sauerkraut you’ll find anywhere. Other sides include German potato salad which is punctuated with perfectly fried bacon. One of the restaurant’s more popular entrees is Kassler (pictured above), a delicately smoked bone-in pork loin (German smoked pork chop) that is pickled before it is smoked. It looks and tastes like a smoky ham albeit not as salty and a tad drier. Dagmar’s Kassler is about half an inch thick and has an absolute minimum of fat with a mild and sweet aftertaste. Los Angeles Times restaurant critic calls it “German food for beginners.” Most will call it absolutely delicious. My favorite entree, one that the menu refers to as “The Ultimate,” is Roulade (pictured above), a beef roll stuffed with bacon, onion, pickle and mustard. Roulade is slow simmered in a rich brown gravy. Despite the tanginess of mustard and pickle, the preeminent taste is beef, a fork-tender cut that may have been braised in wine or perhaps burgundy. It is delicious. The Roulade is accompanied by traditional German potato dumplings and vinegary red cabbage, both of which are noteworthy. The taste contrasts make this meal special. Another popular entree is the Jaegerschnitzel (Hunter’s Schnitzel), a large moist pork cutlet prepared similar to chicken-fried steak which is covered in a brown sauce known as “Hunters sauce” or “sauce Chasseur.” It’s made with mushrooms, shallots, garlic, white wine and possibly cream. Jaegerschnittzel is served with traditional spaetzel noodles. Spaetzel, a term which literally translates to “little sparrows,” are technically little dumplings, though most people refer to them as noodles. The Hunters sauce complements the spaetzel very well. As for the sauerbraten the Italian commandant dreaded as much as he did being found complicit with the allies, it is absolutely wonderful. Dagmar’s rendition is in the Rhineland tradition which means the braised roast beef is marinated in vinegar and a sweetening agent with seasonings that include cloves. It is served with a sauce redolent with crushed lebkuchen (a type of gingerbread) spice cookies. Also on the plate is Dagmar’s red cabbage which marries well with the sauerbraten. The red cabbage is well spiced and has a terrific sweet-tart flavor. Dagmar’s offers a full-service menu including a number of sandwiches. Sandwich options include Black Forest ham and cheese, breast of turkey and cheese, roast beef and cheese, albacore tuna, chicken salad, egg salad and vegetarian. The Black Forest ham and cheese sandwich is terrific with a generous amount of ham piled on some of the very best sandwich bread roll you’ll ever have anywhere. The bread roll is good enough to stand on its own or with a smear of spicy mustard and mayo, but the Black Forest ham and cheese elevate it. Another sandwich option is your choice of bratwurst or knackwurst. The latter is a short, fat and highly seasoned frankfurter, the skin of which makes a “cracking” sound when bitten into (similar to the “snap” of great American hot dogs). The knackwurst is a couple of inches shorter than a standard hot dog, but it’s thicker than most. Most people dress knackwurst the same way they dress hot dogs, too. That is they add a good mustard, preferably a spicy German mustard which complements, but doesn’t detract from the spiciness of the sausage. The knackwurst is served on a brochen (more about his magnificent bread later) and is accompanied by sauerkraut and German potato salad. Dagmar, an absolutely delightful person, will tell you her restaurant serves the very best hot Reuben sandwich in Albuquerque. I won’t argue with her–especially since she may just be right. The Reuben is piled high with corned beef, sauerkraut and cheese on a bread roll that may also be the best home to any sandwich in the city. The last bread roll we’ve had that is comparable to this one was a floury bap in Lechlade, England. It’s a bread roll to inspire rhapsodizing especially with high-quality ingredients such as those Dagmar procures. Dagmar’s bakery features more than thirty varieties of German strudel, some of which are seasonal and others which are, to say the least, unique. Among the former are pumpkin strudel at Thanksgiving and eggnog strudel at Christmas. Among the latter is a raspberry green chile strudel that showcases the taste of New Mexico’s favorite fruit (no, not raspberry; chile is a fruit, a member of the nightshade family). Heat these decadent darlings in a microwave and the intoxicating aroma of green chile wafts toward your happy nostrils. The raspberry green chile strudel actually has more piquancy than entrees at some New Mexican restaurants, but that piquancy is balanced beautifully by the tartness of the raspberries. This is a winner! The bakery sells cookies, pies and cakes and can custom make just about anything you request. You can even purchase handmade pirogis made Polish style. We often buy a dozen or so broetchen, the breakfast roll with the gruff exterior and doughy heart of delicious gold. Time magazine described the broetchen this way, “It lacks the elegance of the croissant, the sophistication of the English muffin, the intrigue of the bagel. But for millions of West Germans, the day begins with Broetchen, the hand grenade shaped breakfast roll so tough that it travels will in trouser pockets and can bear giant charges of Schmalz or butter and jam without buckling.” This is a breakfast roll tailor-made for butter. Not surprisingly, Dagmar’s German chocolate cake is delicious, but those strudels are so good you’ll behave like Sergeant Schultz at the mere mention of this flaky pastry. The thin sugary strudel crust enveloping tart raspberries or apple-cheese (pictured above) are two of our favorites. Equally good are the apple turnovers in which paper-thin flaky dough covers sweet apples. Though the crust falls apart all over your clothes as you bite into it, this messy treat is worth every crumb you pick off your shirt. Dagmar’s coconut maroons are as light as air and sinfully delicious. In fact, just about everything we’ve sampled at Albuquerque’s only German restaurant is wonderful. From the minute you walk in the aromas of bread in the oven covers you like a warm blanket. Holidays are special at Dagmar’s. Valentine’s Day specials include chocolate covered strawberries. For Christmas a must-have is the traditional German stollen (pictured above left). Though Dagmar doesn’t agree with calling it a fruitcake, that’s essentially what it is–though it’s several orders of magnitude better than the much maligned fruitcake many people treat with derision. The traditional stollen is shaped like a bread loaf and is covered with powdered iced sugar. Cut into it and you’ll taste candied orange, lemon, and citron peel as well as raisins, sultanas and other fruits. It’s a very dense loaf and despite the added fruit, is quite low in sugar. At Dagmar’s each loaf weighs in at a hefty two pounds or more. Baking it is a two-day process. Eating it will take less time, it’s so good. When you’re done with your meal, you’ll feel as if your mother herself fed you in anticipation of warding off a cold winter day. This is comfort food at its German best prepared by what would probably be the best German restaurant in Albuquerque even if it wasn’t the only one. We had been walking and driving past Dagmar’s on an almost daily basis ever since the Juan Tabo location opened but memories of searching Munich for days trying to find something decent to eat still haunt my mind. The first day of Brat and potato salad was ok, the second less so. By the third I was going crazy and found a decent English sandwich cafe in the English Gardens and a decent Italian place. Since then many Germans have described wonderful German dishes to me but when I described my experience they would say, “oh, they wouldn’t have that in Munich.” I have also found that the secret in Munich is to go to hotel restaurants which I usually avoid like the Plague. I finally remembered fondly Michelles Old World Cafe and its great food from years ago so we went by Dagmar’s last night. I had the Roulade and the Child Bride ordered Sauerbraten. Service was great and the meal well prepared but I finally decided that my general craving for German food is similar to that of your Italian Commandant’s. WE will probably go back for the Goulash and Green Chile Cheeseburger. I just want to say thank you for all the loyal customers we’ve had over the years…Ive been your Culinary chef at Dagmar’s restaraunt for over 12 years,…please stop in and say “Hello”….please recommend our delicious meals and desserts to your friends and always support your local small business……”Danke”…..
As referenced in my review, Dagmar’s in Rio Rancho is at 2418 Southern. You can reach them at (505) 891-9288. The Rio Rancho store is now offering breakfast, too. Went for lunch with some friends. Enjoyed the warm atmosphere and friendly help. I got the turkey and cheese sandwich. I also got an apple strudel and a blueberry turnover. The sandwich was delicious because the meat and cheese tasted great and the bread was fresh and fluffy. The deserts were tasty and melted in my mouth. Any glitches that they may have had at check out were overcome by the warm and friendly atmosphere and the really tasty food. I made sure to get a flyer and will tell my friends. Oh Dagmar, I hope your new location helps spread your fabulous reputation to the other side of town! There is no restaurant in Albuquerque that will give you the portion/quality for your dollar, period. I second (third? fourth? fifth…) that your bread is the best in town! Thank you for alerting me to the new addition, Gil! I can’t believe you didn’t mention the goulash. Served over spätzle, it is excellent. 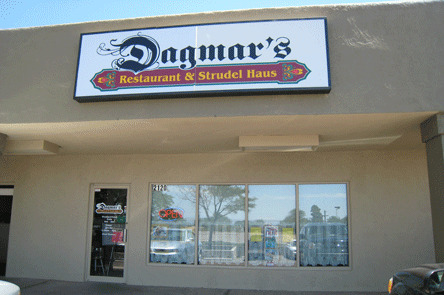 If you appreciate, like or love good German food then you’ll love the food at Dagmar’s. You’ll have to close your eyes a little bit to the Spartan environment and pay attention to the hours they are open, but oh the food! Over the past 6 years my wife and I have eaten at Dagmar’s more than a dozen times, and we’ve stopped in for strudel or stollen to take home many times as well. You won’t find as great a desert in all of ABQ as the strudel at Dagmar’s (my favorites tend to be traditional… apple, apple & anything, raspberry & anything). Don’t go just for the strudel. Sit down and have any meal off the menu. We’ve both traveled extensively in Germany and my wife lived there for a few years. We’ve never had anything that we didn’t rave about as authentic and excellent. Unfortunately they don’t seem to be very busy and I worry and worry that they might not be there some day. Please do stop by so I don’t have to mourn their loss. Yes! Call ahead! Dagmars is like any other family business. They close early as needed, but service & quality of the food at this little gem of a restaurant is worth the extra effort & the money. Frankly, I would gladly pay twice as much for my food. Dagmars is my favorite place in town and if I let her know I am coming, she often will stay open for me. She likely will for you too! I would love to tell you how good the food is at Dagmar’s. Unfortunately, I can’t. We made a long drive in to eat there. Have had many wonderful meals in Germany and was craving some good German food. So do I have to call ahead to make sure Dagmar’s will be open on the hours advertised? Frankly, if they can’t afford to stay open the hours they say they will then they probably can’t afford to lose customers. These two will never be back. I don’t give poor customer service a second chance. I just discovered Gil’s blog, in preparation for visiting NM for the first time. Being one of those millions with German ancestry, all grandparents were from that country, and having grown up with Rouladen, etc., I appreciate Gil’s nuanced review of the classic German dishes at Dagmar’s. I don’t think we’ll get to Albuquerque, but it’s good to know that there is a good German restaurant tucked away in this corner of the U.S. Tried Dagmars Sauerbraten (german for “Sour Roast”) for lunch. It was just like mom (she is Bavarian) used to make. It is served with 2 potato dumplings and red cabbage salad, the roast is smothered with thick rich gravy as well as the dumplings. This is definately a traditional german meal, and you won’t fing this just anywhere. The lunch meal was $16.50, not cheap but very good, it is a labor intensive recipe. The meat needs to marinade for a few days and the potato dumplings are alot of work also. It is a large serving so plan on being stuffed or taking leftovers home. I hope people read this about Dagmars and go visit. Was so happy she reopened just around the corner from my house. They have a great breakfast schnitzle, w/ eggs and green chile and fried potatoes. So good. We used to live minutes from the German border, so this takes us back!